For the last two years I’ve hosted a very unscientific poll/survey to find out what companies over the past year have shown that they were listening. The goal was to get an sense of who stood out among the minds of readers as an organization with open ears. This year however, I’ve decided not to do a survey for 2009, at least not in way as have the past two years. The reason for this decision, comes after spending a large amount of time advising clients on their online monitoring and reputation management plans. I’ve come to understand more deeply that there are many different levels and reasons to listen. Most importantly, I’ve come to grips with the fact that organizations are at different stages when it comes to listening. Strategist Jeremiah Owyang drove this point home with The Eight Stages of Listening. 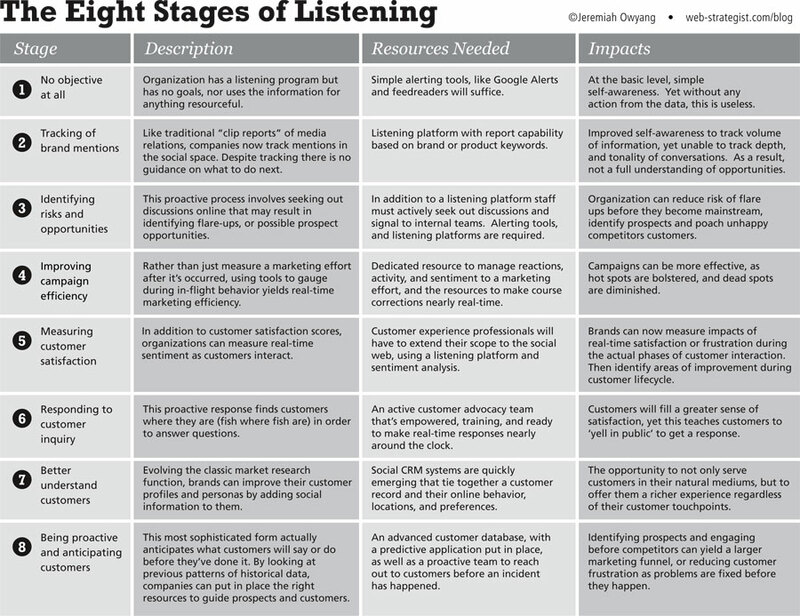 Jeremiah lays out eight different stages of listening that organizations can find themselves in. I’ve found this matrix to be a great resource, but one that brings up new questions. So this year instead of asking, “who was listening,” I want to continue the dialogue that Jeremiah started on his blog. Which of the eight stages are companies at? What stage do companies think they are at? And in reality, what stage are companies truly acting at? You can review Jeremiah’s 8 Stages of Listening in a variety of formats below. I created jpeg and pdf versions for you to add to your resource archive, which you can download below. Description – Organization has a listening program but has no goals, nor uses the information for anything resourceful. Resources Needed – Simple alerting tools, like Google Alerts and feedreaders will suffice. Impacts – At the basic level, simple self-awareness. Yet without any action from the data, this is useless. Description – Like traditional “clip reports” of media relations, companies now track mentions in the social space. Despite tracking there is no guidance on what to do next. Resources Needed – Listening platform with report capability based on brand or product keywords. Radian 6, Visible Technologies, Techrigy/Alterian, Buzzmetrics and Cymfony, Dow Jones are providers. Impacts – Improved self-awareness to track volume of information, yet unable to track depth, and tonality of conversations. As a result, not a full understanding of opportunities. Description – This proactive process involves seeking out discussions online that may result in identifying flare-ups, or possible prospect opportunities. Resources Needed – In addition to a listening platform staff must actively seek out discussions and signal to internal teams. Alerting tools, and listening platforms are required. Impacts – Organization can reduce risk of flare ups before they become mainstream, identify prospects and poach unhappy competitors customers. Description – Rather than just measure a marketing effort after it’s occurred, using tools to gauge during in-flight behavior yields real-time marketing efficiency. Resources Needed – Dedicated resource to manage reactions, activity, and sentiment to a marketing effort, and the resources to make course corrections nearly real-time. Traditional web analytics tools like Omniture, Webtrends and Google Analytics are common. Impacts – Campaigns can be more effective, as hot spots are bolstered, and dead spots are diminished. Description – In addition to customer satisfaction scores,organizations can measure real-time sentiment as customers interact. Sysomos and Backtype have focus areas into this space. Resources Needed – Customer experience professionals will have to extend their scope to the social web, using a listening platform and sentiment analysis. Insight platforms like Communispace and Passenger offer online focus groups solutions. Impacts – Brands can now measure impacts of real time satisfaction or frustration during the actual phases of customer interaction. Then identify areas of improvement during customer lifecycle. Description – This proactive response finds customers where they are (fish where fish are) in order to answer questions. Example: Comcastcares account on Twitter asks customers if they need help –then may respond. Resources Needed – An active customer advocacy team that’s empowered, training, and ready to make real-time responses nearly around the clock. Impacts – Customers will fill a greater sense of satisfaction, yet this teaches customers to ‘yell in public’ to get a response. Description – Evolving the classic market research function, brands can improve their customer profiles and personas by adding social information to them. Resources Needed – Social CRM systems are quickly emerging that tie together a customer record and their online behavior, locations, and preferences. Salesforce, SAP, both have partnerships with Twitter to synch data. Impacts – The opportunity to not only serve customers in their natural mediums, but to offer them a richer experience regardless of their customer touchpoints. Description – Minority Report: This most sophisticated form actually anticipates what customers will say or do before they’ve done it. By looking at previous patterns of historical data, companies can put in place the right resources to guide prospects and customers. Resources Needed – An advanced customer database, with a predictive application put in place, as well as a proactive team to reach out to customers before an incident has happened. Haven’t seen any such application yet. Impacts – Identifying prospects and engaging them before competitors can yield a larger marketing funnel, or reducing customer frustration as problems are fixed before they happen.